I think it's time for a status check on the blocks that I have completed on the Farmer's Wife quilt. I know that I have a long long way to go but, slow and steady wins the race. I'm not sure if I'm going to place sashing between each block or not. More that likely I will so, I should probably start working on that now as well. That way, when I'm finally completed with all the blocks, I won't feel frustrated that I still need to add sashing. Hope you have a great weekend! Hey, I was just searching the quilterblogs.com and came across your Web site in a search for Farmer's Wife. 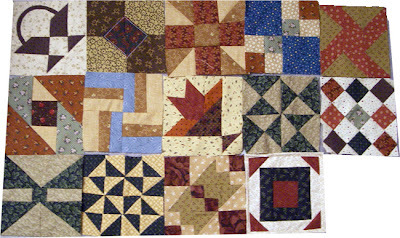 I've decided to start making this quilt and will post progress on my blog at blogs.thekansan.com. I like the way your blocks look together without the sashing! Very nice. I haven't started yet, as I just ordered the book Friday. I think it will be great fun! I'm going to check out your other posts, now!